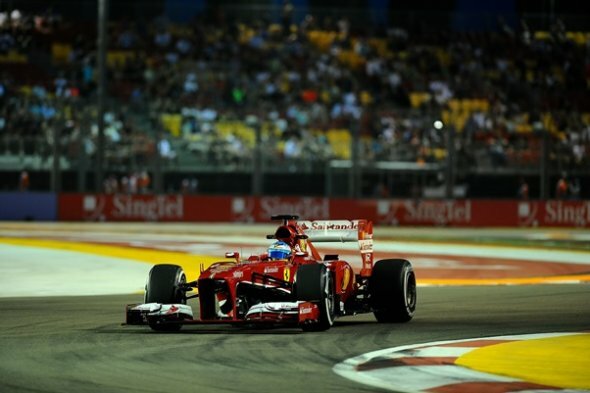 Ferrari drivers Fernando Alonso and Felipe Massa have urged their team to improve after a difficult couple of practice sessions in Singapore. Alonso was sixth in second practice, with Massa back in fifteenth place. "We can’t say this was a good start, because we weren’t competitive, but if we consider that last year, at the end of a difficult weekend we managed to get on the podium, we definitely aren’t throwing in the towel yet" said Alonso. "We have yet to analyse the data, but we certainly have to be realistic, because when you have one car in sixth place and the other in fifteenth, it’s clearly not the result we were hoping for, without taking into consideration the updates we have brought for this race." "Now, we have a lot of work to do to find the right set-up and the best strategy. Then we will need to put in a very good qualifying lap and attack from start to finish in the race. However, we know that won’t be easy because on tracks which require high downforce, we suffer more and, just as in Hungary, apart from the fact that Mercedes seem to be on a par with Red Bull here, there are others who also look strong, like Lotus and McLaren." Massa believes that Ferrari needs to retrace their steps and improve the balance of the F138. "This was a difficult day, because I struggled to find the right way to move forward in both sessions," said the Brazilian driver. "In the first session, we concentrated on evaluating various aerodynamic components, while in the second one, we managed to complete the programme, doing a long run, starting on the Supersofts and ending on the Mediums. Along with the team we decided to go in another direction to try and find a set-up with which I was more comfortable on this track." "Unfortunately this did not produce the results we were expecting. I think that for tomorrow’s qualifying we need to retrace our steps, trying to improve the balance of the car. I am sure it will be better and that I will manage to once again find the car I’m used to driving."